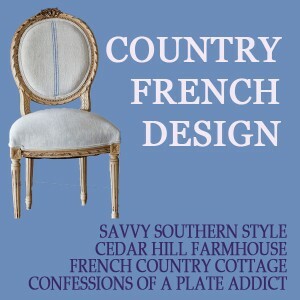 I admit to be a bit obsessed with French chairs. I found these at a consignment store a few years ago. 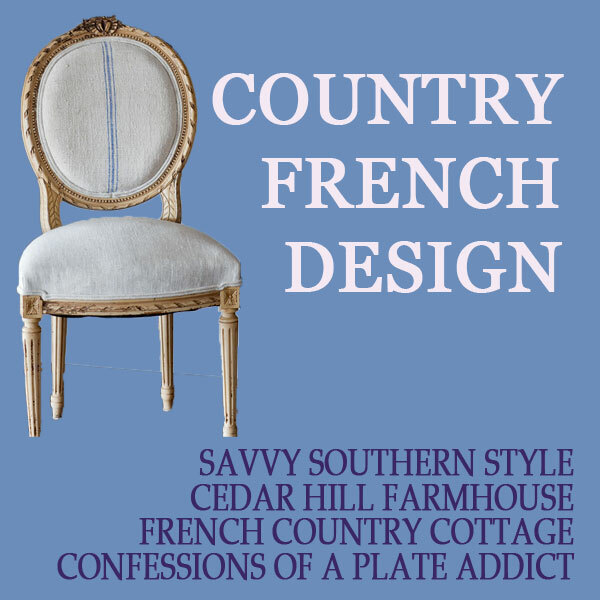 They were inexpensive as French chairs go. They were covered in a tapestry that was okay. The tapestry looks pretty good next to the pine armoire, but was really yellow in person. Well to be completely honest, the seats were stained, and I was happy when I finally decided how I wanted to recover them. 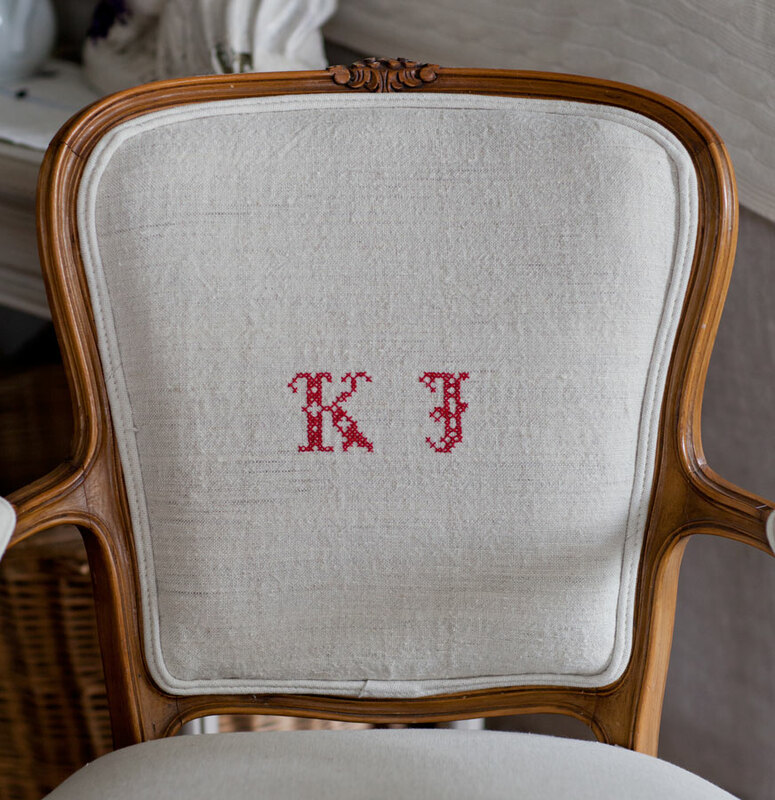 I had some grain sacks with monograms and decided to use that fabric on the chairs. When they were delivered to me, I was told that the chairs had been stuffed with horse hair, and that they had to remove it. I thought, well that’s no big deal. Then the lady said, ‘There were… things living in the horse hair.” That is why they removed it. I was glad I didn’t know that before. Now they are all new clean and fresh foam in the seats. I admit I was a bit grossed out, but back to the room. When I got the chairs back, I thought it would be nice to place them behind the sofa, so we could more easily sit there if we were on our way out the back door. And we do use these chairs more than you would think. 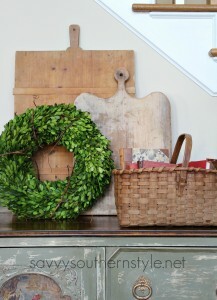 So what if you want this look, but you can’t find grain sacks with a monogram you like? Well if you find some nubby linen, you can have the fabric monogrammed, and then use that fabric for your upholstery. Somebody did some nice needlework on these monograms. I do love how white and bright the room is. You can’t see it in this picture, but to protect the white fabric of the seats, I did put some white place mats on the seats. I’ll show you later. 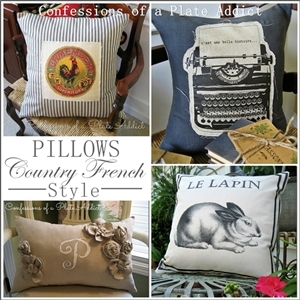 Be sure to check out the other country French posts!! They look beautiful and I love the monograms! The room is beautiful. I just have one question. Why did you put those big bookcases in front of your windows? You never want to block out natural light. In my opinion, it’s way too heavy and too much. I have been an interior designer for 25 years and that has always been a no no. Other than that, you really did a good job on your room. Why did I block the windows with the bookcases? The bookcases are built in cabinets and the windows are actually above and NOT behind the cabinets. So the windows are only about 18 inches tall and they are not blocked at all. For the record, I do agree that windows should not be blocked. 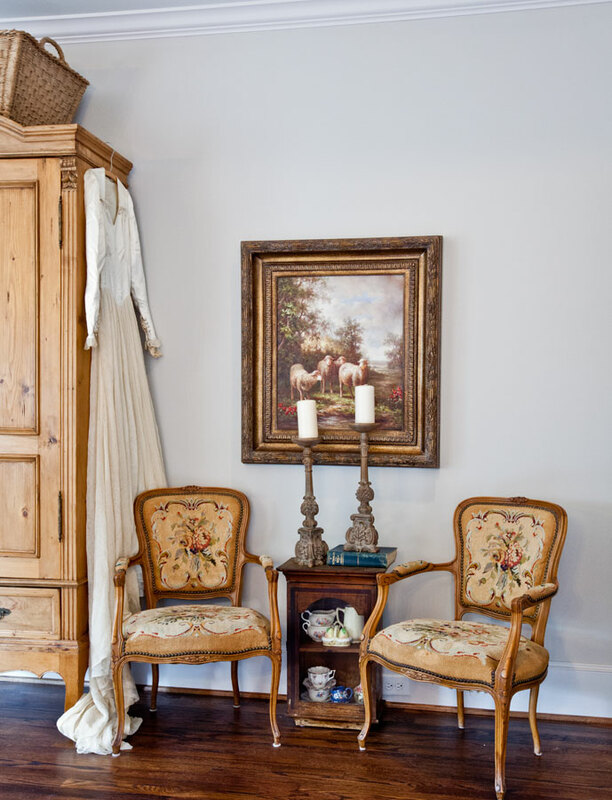 I would love to do the same treatment with a pair of chairs I have but never know where to find that nubby fabric. Can you share your source? I’ll be back in Paris soon and I’m inspired to look for fabrics (easily packable) to bring home. I have two Rococo armless chairs that I want to reupholster for my new cottage. OMG those chairs look awesome! I revamped an old French chair about a year and a half ago.. It was pretty gross with old needlepoint and in rough shape. I redid the whole thing and I love it now. It sits in the corner of my master bedroom. 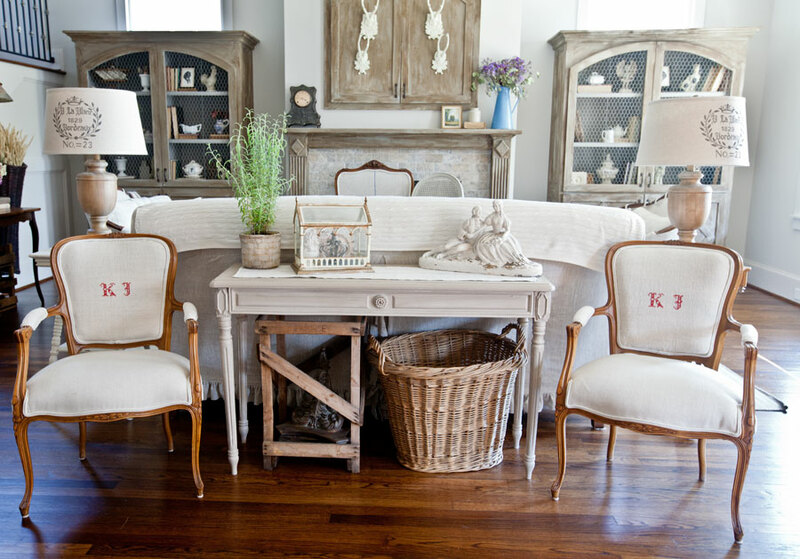 Have always admired your beautiful monogrammed grain sack chairs and the way you also use the grain sacks throughout your home! Anita, thank you for sharing so many wonderful ideas. 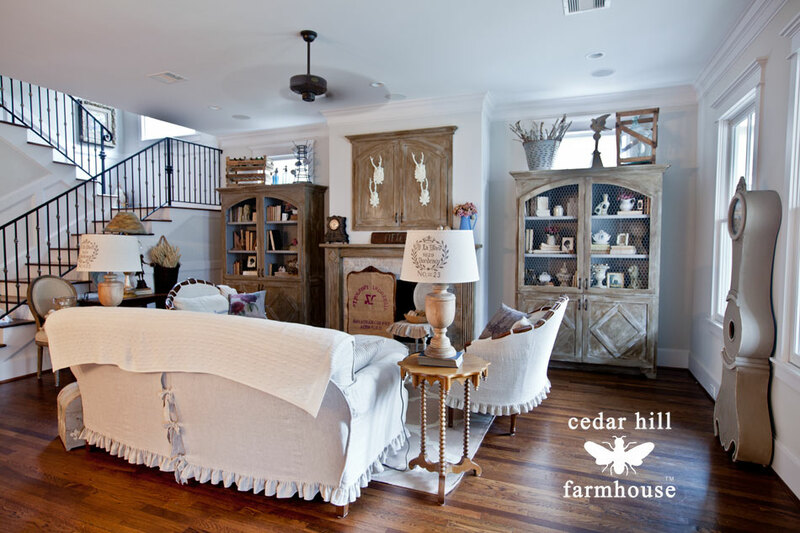 I love to decorate and remodel – my home is a piece of heaven for me and friends and family love to visit since it makes them feel invited and love. That has always been my goal but now we have just bought a new home for our retirement in a new community with new exciting challenges that my husband and I look forward to accomplishing with a retired budget. I have one sofa and a couple of chair that are covered with white fabric so I look forward to hearing about how you cover the seats with a white place mate – I’ve been able to avoid plastic so far with luck. Again thank you for the inspirational ideas and love your home. Ewww! I think I would have been grossed out, too! Especially after coming off of a really buggy summer here in Texas… Ick! Love how you’ve arranged them around the sofa table, Anita!! !